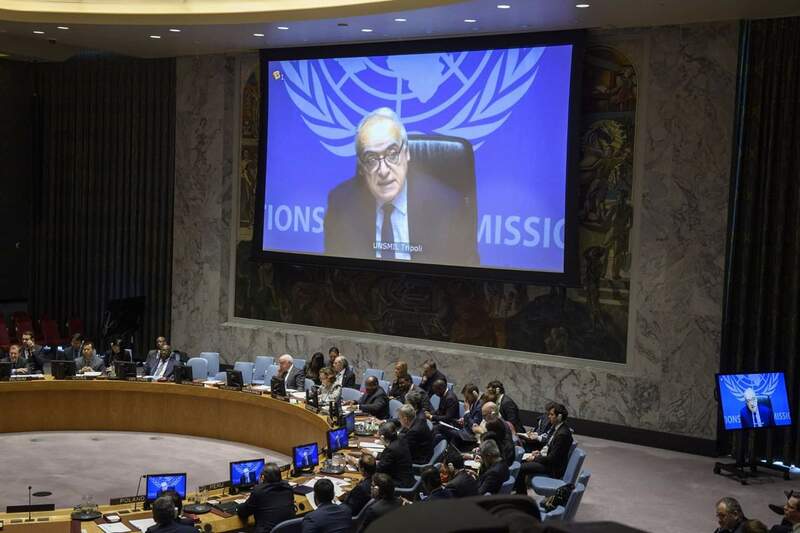 Ghassan Salame presenting his latest briefing on Libya yesterday via a video link from Tripoli to the UNSC (Photo: UNSMIL). 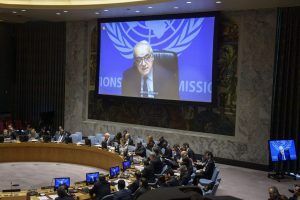 In his latest briefing to the UN Security Council on the situation in Libya delivered yesterday by video link from Tripoli, SRSG and UNSMIL head Ghassan Salame urged Libya’s political class to respond to the daily calls upon it to overcome its fractious, narrow, and self-interested definition of governance. In his report Salame talked about the poor situation in Libya’s south, the south Tripoli militia fighting, Derna, economic reforms, the National Conference and elections. The South remains Libya’s vulnerable heart, encompassing almost 1 million square kilometers of land. The source of much of the nation’s natural wealth, through its water and oil, has been woefully neglected. Despite years of promises to address the situation there, conditions are deteriorating at an alarming rate. I had the opportunity to visit the region’s capital, Sabha, just a few days ago in what was the first visit by an SRSG to the south since 2012. I heard first hand from citizens wĺho spoke movingly about the terrible hardships they endure, from the wanton brutality of Da’esh to wading through lakes of sewage that have been created due to the lack of investment in basic public infrastructure. Add to this the insecurity posed by completely porous borders and the presence of foreign mercenaries and common criminals who prey upon citizens and migrants alike. Many told me that they were fearful to see their family step outside their homes after sunset. I urge the government and international community to move swiftly and decisively in support of the South. The mission has built a specific taskforce to tackle the situation there. Agencies are going to do their duty helping, but it is the Libyan authorities who must shoulder the burden. There is a cost to this inaction. The anger of the Southerners has unfortunately translated into attacks against water pipelines and oil facilities, which hurt Libya’s slowly recovering economy. While the South is an acute case, similar woes, and a failure to alleviate them despite repeated pledges, plague the entirety of Libya. All Libyans struggle with deteriorating public services. Prison detainees, migrants, journalists, members of the judiciary, to name just a few, are subject to abuse and violence at the hands of armed groups. Many thousands live with humanitarian concerns. Civilians continue to live in fear of casualties of violent conflict. Tripoli, after months of calm derived from the September ceasefire agreement, was two days ago once more rocked by renewed clashes. We have worked closely with all parties to stop breaches of the ceasefire from going any further. For now, the violations have been contained. Fighting in Derna is not over. Civilians have been killed in the conflict, families displaced and homes looted. Unconditional, unimpeded and sustained humanitarian access to the affected civilians in the old city is essential but denied. Civilians, including women and children have been arrested and held in the detention facilities, without charge. Meanwhile, the LNA started movement into the South, beyond the positions they held before. Wherever there is fighting, parties must take all measures to protect civilians and civilian facilities, and adhere to International Humanitarian Law and Human Rights Law. Where they do not, we will ensure in time they face the consequences. There are green shoots. Over the last months we have seen some progress in efforts to stabilize the country and to improve the lives of the Libyan people. The Government of National Accord has continued to appoint new Ministers, most recently to the vital portfolios of health and local governance. This reshaped cabinet has improved our scope to support service delivery and reform. We are looking at the various Ministries and deciding how we can, with member states, further assist them with their efforts to reform and deliver. The ceasefire negotiated between the major armed actors in September remains in place, though must be constantly tended. The Minister of Interior has been working hard to advance the Security Arrangements for Tripoli which underpin the fragile ceasefire. The Mission has been providing technical assistance to the newly established security arrangements committee and to the development of a Joint Operations Centre charged with coordinating the implementation of the Greater Tripoli Security Plan. While much remains to be done, these initiatives have helped bring calm to the city. More broadly, there is an imperative to improve security across the country. Terrorists strike in various towns and cities, most recently with the 25 December Daesh attack on the Ministry of Foreign Affairs in Tripoli. Sporadic clashes still spark across the country, as much of law enforcement remains in the hands of armed groups, not professional security officials. Here also, there is hope. Last month, I attended the opening of the refurbished Police Academy, and just this week I was at the ground breaking for a Model Police Station which builds on community oriented and citizen focused policing. Efforts are underway to train hundreds of police and judicial police. We are working closely with the Libyan authorities to transfer control of prisons, from armed groups to trained professionals under the control of the Ministry of Justice. We are also pressing the government to address the travesty of civilians being held in prison without charge or due process. We have been told that hundreds have been released and the cases of many others are under consideration. The economy has continued to stabilize. The black-market price of the Libyan Dinar against the US Dollar has collapsed as a result of the economic measures announced last September. The difference between the official exchange rate and the black-market exchange rate has narrowed significantly. Whereas the parallel rate which was 10 dinars to the dollar a year ago, today rests at 4.3 dinar to the dollar and is expected to fall further. This has had a palpable economic impact upon the lives of many in the country. Inflation has steadied and commodity prices have dropped substantially, in a country that imports a huge part of its needs in hard currency, prices are down sometimes by 40%. The liquidity crisis has finally been combated. In most, if not all, cities and villages, the long queues of people standing for days outside of ATMs to get a meager fraction of their assets is now behind us. Ministers looking at means to further this trend. Both the Finance and Economy Ministries are restructuring and reviewing their personnel to enable them to better deliver on their agendas. Financial crimes advisors are being deployed by our partners in the European Union. With thanks to the German government, Libyan Central Bank staff are receiving technical training from Bundesbank officials. Efforts to conduct an audit of the Central Bank are moving full steam ahead. We have facilitated an agreement between the Central Bank and the Al-Baida branch on the terms for the audit, which we are overseeing. The financial audit will entail a broad review of the balance sheet and financial transactions since the institutional split in 2014, and formulation of recommendations for follow up. This is an important step toward the unification of the institution. Oil production had been over a million barrels per day driving much needed revenue into the treasury. Disturbances at fields in the South over the lack of services to the region have, unfortunately, led to recent reductions in production. It is essential that such grievances be addressed without resorting to threatening the national economy. Much more time and work are needed to create the prosperous, resilient and transparent economy Libya needs. The Mission has retooled itself to better support this transformation. There is now a unit in the Office of my Deputy Special Representative for Political Affairs dedicated to advancing this agenda and is working hand in glove with the concerned international financial institutions. Further, to strengthen all fronts of United Nations support efforts, we have returned the Mission in full force to Libya. I expect to finally re-open our office in Benghazi at the end of this month. We have relocated most of our staff back to country. If security permits, I aim to reopen our office in the South this year. It is vital that we are here, in Libya. Beyond all of the above, we dedicate tremendous efforts to preventing conflict. In a country so finely splintered, each day brings with it new divides that must be closed and fresh potential violence to stop. The life of an SRSG is also one of a firefighter, and the fires are many that need to be extinguished. Clearly, this cannot be done from abroad, we must be here. We must also be realistic. Even the best of efforts, without united and concerted national leadership, will only go so far. The various gains I described are fragile and reversible. In this political environment, they will eventually break. Predators will find ways to circumvent the economic reforms. Actors will choose violence over politics. The recent events in Tripoli are a prime example of this. We can fight fires, but eventually, there will be an inferno that cannot be extinguished. And so, we must go beyond, and tackle the underlying dysfunctionalities of the Libyan state. The political deadlock in Libya has been underpinned by a complex web of narrow interests, a broken legal framework and the pillaging of Libya’s great wealth. Only Libyans themselves can plot a path out of this malaise, towards stability and prosperity. Over the last year, we have received growing demands that we facilitate a National Conference to allow them to do just that. In the coming weeks, we shall seek to do so. Libyans from across the country, women and men, will gather in one place and decide how the Nation should proceed to the end of the transition. Given the criticality of the event, it is vital that the National Conference is held under the right conditions, with the right people, and that it is capable of concluding with an outcome that is agreeable to the broad majority. We are working night and day to pull together these various elements to ensure the most productive event. Once the essential ingredients for a new consensus on a national agenda to rebuild a capable and united Libyan civil state have been agreed upon by the major players, we will be ready to state the exact date and venue. I am encouraged by the commitment these Libyans have expressed towards a new national agenda, and their forward-looking approach. It is high time that the political class responds to these daily calls upon it to overcome its fractious, narrow, and self-interested definition of governance. It is indisputable that the citizens of Libya wish to have elections at the soonest opportunity. One key outcome of the National Conference must be to spell out the electoral path ahead. The Electoral Commission is working to ensure that technical aspects are in place for any electoral event – including a referendum on the Constitutional draft. We take note of the discussions between the Commission and House of Representatives with regards to referendum legislation and as always, encourage constructive engagement. Prior to any election, key concerns must be addressed. Fundamentally, there must be genuine political support for whatever election is conducted and guarantees that the results will be accepted and respected by all. Funding is required. Security arrangements for electoral events must be determined. Public services must be working. If the status quo actors truly engage on the National Conference, I believe that much of this can be more smoothly addressed. Municipal elections are an important element of grassroots democracy and have provided an encouraging test for national elections. After the successful polls in Zawiya, Derj and Bani Walid conducted, I welcome the start of the voter registration on 12 December for some 60 more Municipal Council elections, with polling planned starting in March 2019. The last months and years have been defined by a struggle between entities and individuals; fueled by personal ambitions, underpinned by institutional dysfunctionalities, leading only to a deteriorating status quo. However, what is past can be prelude. Now is the time for Libya to come together in the spirit of compromise and overcome past difficulties. I beseech the members of the various Libyan institutions to see the National Conference as a patriotic concern that transcends partisan and personal interests. To embrace it as a means to be the leaders this great country needs. Of course, there will be those who seek to undermine the National Conference and its outcomes; particularly individuals hoping to delay elections so they may remain in their seats. Competing interests are natural; however, they should not undermine state rebuilding and institutional reunification. Without the concerted support of the international community, spoilers will sabotage the political advancement and undo any progress made. If this were to be allowed, Libya’s progress will be set back years and almost certainly open the door to those who believe there is only a martial solution to Libya’s woes. Vital counter-terrorism activities will continue to be hamstrung without the accompanying state building they need to be truly effective. Your support to our efforts and clear signals of resolve to the many potential spoilers are vital. Within your grasp, you hold the opportunity to make the National Conference a success; and municipal, parliamentary and presidential elections a reality. With all this, to foster Libya’s transformation into a stable and secure state based on unified bodies and democratically-elected institutions. I can only encourage you to seize this opportunity.